Spring is here, with St Patricks Day! 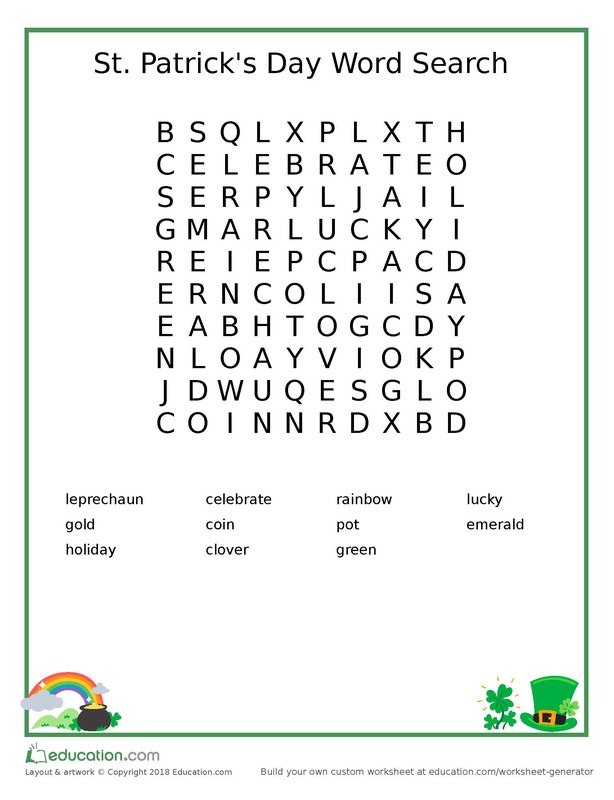 Add a little fun into some St. Patrick’s day learning with this word search. You can find more challenging and creative educational activities at Education.com. The site was built with the contributions of thousands of teachers, and they have FREE activities for kids from preschool through 6th grade–activities that help them succeed in science, math, reading, writing, and social studies. They teach with games, songs, worksheets, interactive exercises, hands-on activities, and more. For example, Education.com let me use the printable word search below for this blog. 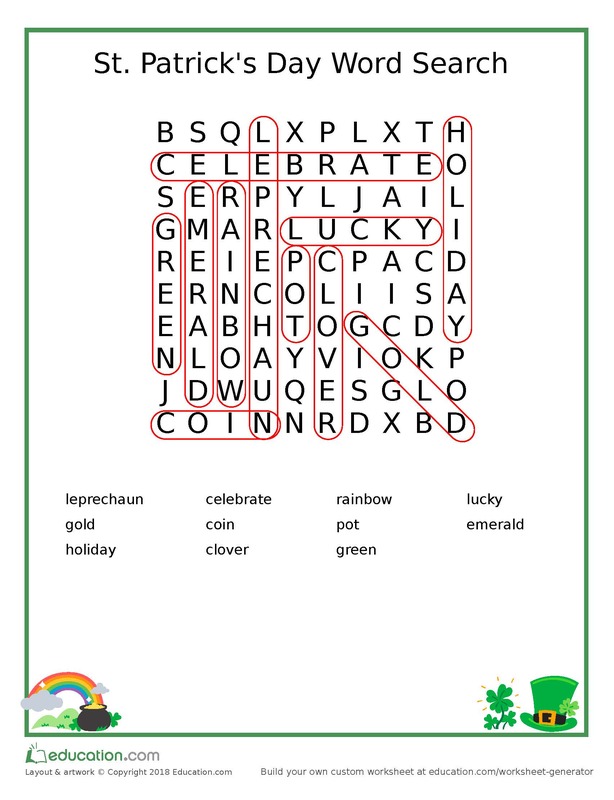 Doing word searches helps kids with reading and writing skills, which are at the heart of learning–they apply to all other aspects of education whether that be understanding analytical math texts or practicing creative expression through poetry. Kids learn while they think they are just playing a game. Check out Education.com for great resources for every age child, from helping kindergarteners create stories to geography challenges for sixth graders. And no, they are not paying me to write this–it’s just a great site. Summer break has been going on for quite a while now. Running out of things to do? Counting the minutes until school starts again? One of my favorite sites for kid’s activities is Education.com. The site was built with the contributions of thousands of teachers, and they have FREE activities for kids from preschool through high school–activities that help them succeed in science, math, reading, writing, and social studies. For example, Education.com let me use the printable maze below for this blog. Doing mazes helps kids learn problem solving, fine motor control, visual motor skills and confidence–all while they think they are just playing a game. Also check out Education.com for great summer break learning resources for every age child, from helping kindergarteners create stories to geography challenges for sixth graders. I am not an immigration lawyer; I am no expert in immigration. But I know that we cannot resolve our immigration crisis without dealing with actual facts rather than just making up stuff that fits with what we already believe. And we do need to fix this, because abusing children is just not acceptable. Why Don’t Immigrants Just Become Legal? “First, I want to acknowledge that asking why people don’t just become citizens, or whether people without legal status can get public benefits that U.S citizens cannot, are legitimate questions. If they are asked in good faith, no one should mind you asking them. “Therefore, let me answer your questions. Family-based petitions. This means that a U.S. citizen or Permanent Resident parent, spouse, adult child, or sibling files a “petition” for you. Depending on the category that you fall into, the wait will be anywhere from 1 – 22 years (yep) before you can use that petition to take the next step – applying to become a Permanent Resident (background checks, medical exam, more fees, etc.). That works for people living outside the U.S., but for those who have been here, it may not be possible if they entered the U.S. illegally, even if they were minor children when they did so. Employment-based petitions. A U.S. employer can similarly sponsor you, but generally only if you are in a profession requiring an advanced degree or unique skills (doctors, software engineers, world-class athletes to coach professional sports teams, etc.). Even then, the potential employer must generally also prove that they made good-faith efforts to hire a U.S. citizen for the position, but no qualified applicants applied. Diversity visa lottery. Every year, the U.S. government selects 50,000 people worldwide who enter a lottery and pass background checks to come to the U.S. as Permanent Residents. This lottery, however, is only available to people from countries that traditionally send few people to the US – so, for example, people from countries such as Mexico, the Philippines, China, Guatemala, India, El Salvador, and other countries that send larger numbers of immigrants to the U.S. do not have this option. “Extra note: The current Administration has actively sought to eliminate or dramatically limit Options #1 and #3. The new term being used in the attempted re-branding of Option #1, family-based immigration, which has been the basic principle of U.S. immigration law for over a century, is “chain migration”. If those two options are in fact eliminated or curtailed, legal immigration to the U.S. will be significantly reduced. “The KEY POINT to all of the above: If you do not qualify for one of these 3 options, then there is no “line” to get into to legally become a Permanent Resident and eventually a U.S. citizen. So, if you are not fortunate enough to have, say, a U.S. citizen spouse or a graduate degree in computer science, you very likely can never become a citizen of the United States. “Second, one commenter above asked why President Obama, when he established DACA in 2012, did not just create a path to citizenship for these young people at that time. The answer: earlier that year, Congress had for the 11th year in a row failed to pass the Dream Act, which would have done exactly that. The President acting through his authority as head of the Executive Branch cannot create a path to Lawful Permanent Residency (and eventual US citizenship). Only a law, passed by Congress and then signed by the President, can accomplish that. So President Obama on June 15, 2012 created the more limited DACA program through Executive Action – which is why President Trump, as the new President, was able to end the program, also without an act of Congress, last fall. Do They Get All Kinds of Public Benefits? “Finally, as to the question of immigrants receiving public benefits, only a U.S. citizen or a Lawful Permanent Resident (green card holder) can receive almost all types of public benefit – including Medicaid, Medicare, SSI disability, Social Security payments for seniors, TANF, and food stamps. The irony: most undocumented immigrants work under made-up Social Security numbers and so receive a paycheck from which Social Security, federal income taxes, and state income taxes are withheld, and of course they pay the same local sales and property taxes as anyone else through retail purchases, pass-through costs of apartment leases, etc. Same of course goes for the 800,000 current DACA recipients, who are authorized to legally work in the U.S. But none of those employees, despite paying IN to the system, will ever receive those public benefits listed above, that are paid for by the money withheld from their paychecks. So they are propping up our federal and state government entitlement programs because they pay in but won’t ever take out. Public education for children in grades K-12. This was definitively established by a 1982 Supreme Court case, Plyler v. Doe. The Supreme Court in its reasoning explicitly stated that it would not serve the overall public good of the U.S. to leave many thousands of children uneducated. Emergency room services, but only to the point where the patient is considered “medically stable”, at which point he/she is released. These services are not free, however, as in my job I meet hundreds of immigrant families who sacrifice over years to slowly pay off high emergency room medical bills. WIC assistance. This is for milk, food, etc, and available only to pregnant mothers. The rationale is that the children in the womb will be U.S. citizens when born, and therefore it is in the long-term economic best interests of the nation to ensure that they receive adequate prenatal nutrition to improve their chances of being productive citizens in the decades to come. Assistance from police if they are the victim of a crime and call for help. To their credit, the vast majority of our Colorado Springs law enforcement officers take their duty to protect all people seriously. Chief Carey of the CSPD and Sheriff Elder of the EPCSO have made clear that their officers can’t do their most important job – keeping us safe by getting dangerous criminals off our streets – if a whole class of people (undocumented immigrants) is afraid to call 911 to report crimes that they witness or are victim to. Assistance from a fire department. Rationale, besides the obvious moral one: If your house was next to that of an undocumented immigrant family, would you want the firefighters to let that house continue to burn, putting yours at risk of catching on fire too? “And that’s it. Those, to the best of my knowledge, are the only public benefits that an undocumented immigrant can receive in just about any part of the United States. As someone who directs a small office that works with hundreds of low-income immigrant families per year, know that when I see the precarious economic situation of many of these families, I’d help them access other benefits if they could. But they simply can’t. Now, children of undocumented parents, born in the U.S., are U.S. citizens under the 14th Amendment (the one that declares that all human beings born on U.S. soil are citizens – this was passed immediately after the Civil War to forever end the legal argument that African Americans were not U.S. citizens). As such, those children can qualify for the same public benefits as any other U.S. citizen, if they qualify through economic need or disability. But their parents or undocumented siblings cannot. Allergies happen when a body’s immune defenses overreact to something in the environment. They decide that a molecule of pollen or mold is a dangerous invader and it needs to be killed. Queue the mucus, swelling and itching. If your child has the tendency to wheeze, queue the airway spasm as well. If he or she has sensitive skin, also expect an outbreak of dry itchy patches. If they keep the mucus, swelling and wheezing for a while, they can develop secondary infections like earaches, sinusitis and pneumonia. Kids can be allergic to a multitude of things. They can react seasonally to flowers in the spring, to grasses in the summer and fall, or to wood fires and Christmas trees in the winter. Year round allergens include molds, mildews and dust mites (tiny bugs that live in dust and upholstery, feed on flakes of skin. and leave behind their poop). Many children are allergic to pets–especially cats and birds–and react to the pet’s feathers, fur, saliva or skin scale. The poisons in cigarettes are common triggers, as are fumes like perfume and air pollution. Scents and dyes in soaps and detergents can cause allergic reactions. Some kids react to contact with latex or metals like nickel. Food allergies are different–a whole blog in themselves. How do we prevent an allergy attack? Never smoke in your house or car. If the allergy is to pollens, keep your air conditioner on seasonally and buy filters that catch allergens. Dust mites? Cover your child’s mattress and pillow with zip up covers designed to contain them. Don’t use curtains in his or her room, or wash them weekly. Limit stuffed animals to those you can wash in hot water with their bed linens once a week. Dust with a damp cloth (also sorry). Molds? Fix any damp areas in your home. Use that bathroom vent – timers that shut off automatically work great, and are easy to install. Clear out vegetation close to the house, and discard any dead plant bits. Medicines can help prevent allergic reactions. If avoidance is not enough, your munchkin can take an antihistamine as needed to block the allergic reaction. Try to stick with the newer, non-sedating antihistamines: claritin, zyrtec or xyzol, allegra and their generics. If an exposure is inevitable (“We have to go to Grandma’s and you know she has that cat!”) you can give them an antihistamine about an hour before. If they are going to be exposed to their allergy trigger every day for a while (springtime pollen? ), they can take the antihistamine every day, if you buy the non-sedating type. If their allergies are chronic, a daily steroid nose spray or a preventative medicine called Singulair (montelukast sodium) can also help prevent the symptoms. Offer them lots of water to wash the allergens out of their system. If they still have symptoms, allergy testing can help to pinpoint exactly what they are allergic to, so you know what to avoid or clean up. Knowledge is power. It does no good to find a new home for the cat if the child is only allergic to mold. Poor kitten. Last, if avoidance and medication are not enough, your physician will bring up the subject of allergy shots to desensitize your munchkin to the allergen. He or she will not be thrilled. Allergies are miserable, but there are things you can do to make your child more comfortable. Prevent the exposure if you can, and give medication if you can’t–either a short term antihistamine or longer term preventative nasal sprays or montelukast sodium. Consider allergy testing and shots when those simpler therapies don’t work. And hydrate. Soon, the season will change. Today’s blog was written by a fellow pediatrician, Dr. Chad Hayes. I could not have said it better. Florida has some of the most lax gun laws in the country: anyone over 18 can buy a semi-automatic weapon with no license, no firearms registration, and often without a background check. This is the state that, for a while, made it illegal for pediatricians to council parents on gun safety. If a pediatrician told a parent their guns should be in a safe, unloaded, without a bullet in the chamber–that doc could be arrested and charged with a crime. The NRA owns our country and our politicians, and it is indeed too late for us to save the 17 children who died today. It is not too late to make rational gun laws that will save the kids who are sitting beside you doing their homework tonight. I’ve not heard of many school batonings. Among similarly-developed nations, frequent school shootings are a uniquely American problem. In fact, they are so common that many occur without drawing significant media attention. There have been several in 2018, and we’re only in week 7. I’m writing this just a couple hours after the mass shooting at Marjory Stoneman Douglas High School in Parkland, Florida. Reports from the scene are still fluid. From what I’ve heard so far, the shooter is in custody, and there are multiple fatalities (update: 17 so far). Those details, no doubt, will change. We will learn the true number of people injured and killed. We will see the faces of children who spent their last Valentine’s Day bleeding out on the floor of their school. We will learn the shooter’s identity (Nikolas Cruz, a 19-year-old former student), the weapons used (an AR-15 rifle), and possibly a motive. But my intent is not to provide these details. I’m not a reporter. What I am is a father that cannot imagine losing a child. I am a pediatrician that cares very much about the safety and well-being of children. One that believes that no child should live in fear of being gunned down at school, that no parent should have to bury a murdered child, and that the number of times this has happened without any significant action to prevent the next tragedy is unacceptable. I am a physician that has resuscitated children with gunshot injuries, and tried to resuscitate others. Some were suicides. Some were accidents. Their stories are powerful, but they aren’t mine to tell. And that seems to be the response every time this happens: “It’s too soon.” “Don’t politicize this.” “You’re using the victims to promote your agenda.” It’s the same response I heard after, just seven miles from my house, nine people were murdered in Emmanuel AME Church. It’s the same response I heard after 58 people were killed at a concert in Las Vegas. It’s the same response I heard when twenty 6- and 7-year-old children were murdered at Sandy Hook Elementary School. So, yes. I’m using the victims to promote my agenda. And I feel like their families would probably be alright with that, because my agenda is to minimize the future victims. Here’s the thing: There is no simple solution. There is no single solution. There is no perfect solution. There isn’t one change we can make and magically make gun violence disappear. As with many issues, the answer—if we find one—will likely be found somewhere in the middle of two extremes. Firearms are so ingrained into American culture that to think it is at all feasible to ban them altogether is asinine. And to pretend that there are no steps we can take to work towards a safer environment for ourselves and our children is equally absurd. The Second Amendment was written over two centuries years ago. The men who wrote it would not recognize and could not have anticipated the weapons available today. What they did anticipate was that the future would look remarkably different from their present, which is why they built into the Constitution a means to amend it in the first place. The Second Amendment, despite what the NRA would like you to believe, is not immutable. At the time the Bill of Rights was signed, the most common weapons were muskets capable of firing a single shot before a rather complex and time-consuming reloading process. Today’s weapons are far more accurate, far more powerful, and unbelievably fast. The term “semi-automatic” means that a round is fired with each pull of the trigger. This is to distinguish it from other types of firearms that require an additional action, such as the movement of a lever or bolt, to load and fire another round (and also from “automatic” firearms which continue to fire until the trigger is released or there is no more ammunition). But while the term “semi-automatic” is frequently used in such a way as to demonize the weapon, the reality is that’s just how firearms work today. Just as most modern vehicles include automatic transmissions and power windows, semi-automatic handguns and rifles are pretty much the standard. And in most states, anyone over 18 years of age (21 for handguns) and without a criminal record can walk into a store and purchase one. A common example of a semi-automatic firearm is the AR-15 used in the Parkland massacre. These rifles are made for one purpose: to kill people quickly. Because in combat, that’s the goal. But these firearms are not restricted to the military; they are widely available to the civilian market. Certainly, most people that own them do not intend to murder their innocent neighbors; most people that own firearms are law-abiding citizens that simply enjoy shooting them at the range or keep them in case of some real or imagined catastrophe. There are better firearms with which to hunt. There are better weapons with which to defend oneself or one’s family. But there is no better type of firearm (at least, not one available to civilians) with which to kill a lot of people very quickly. And the teenage murderer in Parkland, Florida knew that. It is clear to me, and I think most people would agree, that there are some weapons that should not be available to the general public. At some point on the continuum from a baseball bat to a nuclear bomb, there’s a point at which one’s right to self defense is outweighed by the risks that a particular weapon presents to the rest of us. We can argue about where that point is. And we should. We should argue about where to draw that line. We should talk about what further steps we can take to prevent people who shouldn’t have guns from obtaining them. We should talk about ways to encourage safe storage of firearms and ammunition. We should talk about preventing sales of firearms without background checks at gun shows or by individuals. We should talk about the education, training, and licensing that should be required to own a firearm. We have a lot to talk about. I am not the expert in this field. But there are experts in this field. We should listen to them. Because while a good guy with a gun may occasionally stop a bad guy with a gun, it would be far better to have bad guys without guns. As emotionally charged as mass shootings are–especially those involving children, they account for only a small percentage of the 30,000 or so gun deaths each year in the US. Far more people are killed by firearms in less spectacular situations like suicides, accidents, domestic disputes, or gang violence. And while we will not be able to prevent every firearm death, we can make a difference. The thoughts and prayers aren’t working. It’s time to do something. Because it’s not too soon. It’s too late. Ask their parents. Today’s blog is brought to you by MyraMakes.com. Myra Makes is a creative education company based in Boulder, Colorado. Their mission is to empower kids with a love of learning and inspire them to embark on their own creative adventures. They approach education in a kid-centered way–they believe that by introducing opportunities for kids to express their natural creative potential, they can help cultivate the generation of forward-thinking innovators that we so critically need. They brought the adventure to life with their first product, the creative learning adventure book Journey to Cloud City, available on Amazon, and they have allowed me to put some of their printables on the blog. (Reprint only for non-commercial purposed only, please!) Designed to make problem solving, empathy, and teamwork fun, their first interactive storybook was created from over a year of feedback from parents, kids, and educators. They introduce problem-solving through adventure, in which children follow their main character Myra as she meets new friends and creates solutions to the challenges that come up along the way. The activities below are selections from Journey to Cloud City. Extend the activities by using arts and crafts supplies to build the environments, solutions, and characters in real life after you’ve drawn on the printable! Use pipe cleaners, pom-poms, building supplies such as Legos. Re-use materials such as bottle caps and scrap cardboard. Parents, work with you kids on the activities–they’re often just as much fun for adults as kids! Remember to be as open-ended as possible when offering suggestions or asking your kids questions when they’re working on the activities. The crew at MyraMakes is always interested in connecting with others who share their passion for inspiring kids as problem solvers, and would love to hear from parents, teachers, and others with collaborative opportunities or interesting stories to share at support@MyraMakes.com. Enjoy the activity pages below! Happy New Year! Time for those resolutions. 10. Require chores. Equal participation is fundamental to receive the reward of being in a family. The pride your children feel serving the carrots they helped peel is well worth the time it takes to get them to do it. Every member of the family contributes, to the best of their ability. Family bonds and trust will form over the raking of leaves. 9. Make rules, and enforce them consistently. Rules keep kids safe, teach them right from wrong, and civilize them. Make sure your child understands the rules, and every single adult in his life needs to enforce every rule each and every time. No “warnings,” because you made sure ahead of time that they understood the rule. Decide what the consequence will be for a broken rule long before you need to enforce it; make the punishment appropriate for the crime (timeout? loss of the toy? paying for the damage?). Read 5 Reasons Why Kids Need Rules. 8. Feed the munchkin a healthy diet: whole foods that look like they either grew out of the ground or walked on it (I know, but not everyone is a vegetarian). Teach your children to eat when they’re hungry, and stop eating when they’re not hungry anymore. Aim for about 2/3 fruits, vegies and whole or enriched grains, and about 1/3 protein (meat, eggs, cheese, beans or nuts) and starch (potatoes, corn). Everything else will be easier if they are well nourished. Check out All the Right Foods. 7. Keep a regular sleep schedule – both enough hours and at about the same time every day – as much as possible. Kids who are short on sleep are irritable, tired and have no attention span. Everything else will also be easier if he or she has had enough sleep. 6. Keep them safe when possible. There are lots of surprises out there to keep life interesting; there is no need to risk preventable injuries. Use those seat belts and bike helmets, lock up the household poisons, guns and Grandma’s meds, and get those vaccines. 5. Teach financial responsibility. Spend less than you make, stay out of debt, and save for the future. Do it where they can see you and explain what you are doing. Go through your budget with them in an age appropriate way, and feel free to say, “We can’t afford that.” Give them an allowance for those chores and require that they save some. 4. Don’t wear blinders. Your primary job is to protect this child, even if it is sometimes from themselves. Children will lie, take things that are not theirs, and sneak out at night when they are 14. You need to catch them so that they learn that it doesn’t work. If they get caught stealing at 7, they have an embarrassing memory of having to go back and pay for what they took. If they get caught at 25, they land in jail and loose their job, partner, and children. 3. Give them love without condition. Love the child you have, not the one you dreamed they would be. Love is not a prize you can give when your child is good, and take away when they do not live up to your expectations. Without the absolute faith that no matter what happens or what horrible thing they do you will still love them, the foundation on which they build their life will by shaky and unstable. You chose to have them – unconditional love was part of the deal. 2. Nurture your child’s unique talents and abilities. Don’t try to fit the ones you want them to have on an unsuitable frame. This little person is an original – why would you want to shove him or her into a standard form? And what irreplaceable gifts would be forever lost because you did not value them? Respect the exceptional person that he or she is. 1. Inspire them with your own life. Be what you hope for them. Find work you love, maintain a healthy relationship with your partner, eat a healthy diet, and exercise. Learn something new every day. Never lie. Give respect, and demand it for yourself. Keep an open mind, explore the world and grab opportunities when they happen by. Make your children proud. My daughter the anthropologist tells me that celebrations solidify relationships between people within a community, give them hope for the future, and serve as rights of passage. These are excellent goals to keep in mind as you enter into the holiday insanity. What you want this season to mean to your children throughout their lives? Do you want them to be involved in your community with its rich heritage and history? Emphasize that. Tell stories, act out events and celebrate your history. Help out people who are less fortunate. Do you want holidays to strengthen family bonds? Put family first. Limit the decorating and shopping and work events, and hang out at home. Make gifts for each other, bake cookies and play games. If you want holidays to be about joy, be joyful. Foster realistic expectations, appreciation for what they have and genuine values. Develop traditions that are more about time together as a family and less about how much stuff they get. The memories they keep forever will be the little things: sharing a bowl of popcorn while watching an old movie; reading a book while Mom or Dad runs fingers through their hair. Few people remember what they received for Christmas last year. They do remember that walk on Christmas Eve admiring the sparkling lights, tasting cookies straight out of the oven, and the look on Grandpa’s face when he got that homemade penholder. It’s tempting to get your children all the things they want for the holiday just to see them smile, but where do you go from there? Maniacal happiness is not joy. It cannot be sustained over time. Add to that that you have created unrealistic expectations for all the other holidays in their future. And the storage needs! Restrain yourself. If holidays are about family time, board games, and baking cookies it is possible for holidays later in life to be happy. If holidays are about how much money was spent and how many new toys they received, how can real life ever work out? Bigger and better toys every year? That was not the goal. If you can afford it, get them one or two of the things on their lists. Make them the ones they can create with, the ones that make them use their brains and bodies and talent. Add on some little things that are fun to open. Let little ones play with the boxes and bubble wrap. Then focus the day on family. Don’t let holidays overwhelm you. There are so many expectations that no one can possibly meet them all and have any joy left. There are special foods that need to be prepared, special clothes that need to be bought, decorations, gifts, traditions to be followed, parties, travel, family… eeek! Weed out the excess so there is room left for joy, relaxation and rejoicing in whatever you were celebrating. Before you decide to spend money on gifts or travel, be realistic about what you can afford. What did you get for your last birthday? Don’t remember? No one does. What people do remember is the conversation, the hugs and the warmth. Those are free. Take dollars out of the experience as much as possible and you won’t end up with a credit card bill for a present that was discarded six months ago. Don’t try to keep up with the people who have that bill and you won’t be laying awake at night and fighting with your spouse instead of relaxing snuggled up with hot chocolate. Tune down the stress. Not spending more than you can afford will eliminate a huge amount of stress. Next, stop worrying about what other people think; they’re too busy worrying about what you think to care anyway. Keep to routines as much as possible. Sit down for meals; take some time to focus on each other. Step back from the hysteria and think about whether your progeny will actually play with that new doll or just stuff it in a corner, and whether you really need to travel or attend all the parties. Take some quiet time and relax. The world will not collapse if you skip a party or miss the line for the “it” gift. It will collapse if your child is so exhausted and stressed that he or she has a melt down. Keep healthy. The week after a holiday is always busy at my office. I make lots of money from airplanes crowded with sick people and stores packed with germy carts. Get enough rest, and hydrate. Use hand sanitizer. Eat as healthfully as possible–avoid fast foods, throw in some fruits and vegies. Hide the caffeine and limit alcohol. Get a flu shot. Nothing can destroy a holiday quicker than a trip to the ER. Avoid injuries. Most holiday injuries have nothing to do with the particular holiday, but everything to do with people being so busy that they are not as watchful as usual. Sports are more dangerous when we want to impress cousins. Teenagers tend to get more reckless during a celebration, and young children sneak away quickly. Most holiday injuries are from everyday activities and household objects made dangerous by the holiday craziness. Chokings and poisonings are popular. The one I see most is an overdose on Grandma’s meds. At Grandma’s home they are left on countertops; at your home they are in her purse. A left over drink is a common way to poison children. A little alcohol can drop a child’s blood sugar and throw him or her into a coma. Toddlers will put anything in their mouths. Unfortunately this means that everybody needs to pick up their stuff. Items over 1¼ inch in diameter are generally safe. Smaller items than that can go straight into their gut or lung. 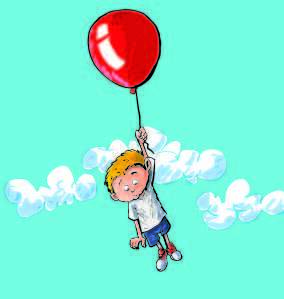 The most dangerous items to swallow are batteries and magnets; the most dangerous to choke on are grape sized (older children’s toys, hard candy) or stretchy (balloons, plastic bags, marshmallows). Clean up! Holidays also provide a banquet of things to irritate children’s allergies. Live trees indoors, foods, cigarette smoke, wood fires and other people’s homes and pets come to mind. Avoid them if your child has allergies. Fires and electrical injuries are especially common during holidays. Decorations can be flammable, old Christmas trees will be dry, and space heaters, candles and fires are commonly nearby. Frayed and loose wires easily start fires. Keep your eyes open for dangers. Use your common sense during celebrations. If it doesn’t seem safe, don’t let people pressure you into it. Feel free to let watching your kids take precedence over seeing Uncle Joe’s trophy or Aunt Mary’s vacation photos. “He’ll be fine” doesn’t make him fine. Keep an eye on him, or her. Feel free to be rude and head for home when the kids get tired, if a situation feels out of control, or if your child is being exposed to something you aren’t happy with. Use the munchkin’s youth or fatigue as the excuse for you to head home, relax and read a bedtime story. Remember that the point of celebrations is to solidify relationships and give hope for the future. Get there by focusing on your history, rejoicing in your present and not sabotaging your future. Don’t go crazy with gifts: they don’t teach your children anything you want them to learn and the financial stress will eat away at that joy and hope you were dreaming of. Pick fewer things to do, and do them together. Be safe and stay healthy.